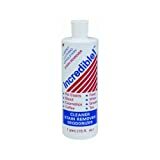 A stain remover, cleaner, and deodorizer that has proven to be the finest, most unique stain remover available today for carpet, clothing, and upholstery. Easy to use; just apply, agitate, and blot. Nontoxic, nonflammable, and biodegradable. Approved for stain resistant carpet. This product takes out pet stains, blood stains, cosmetics, coffee, food, wine, grease, and tea stains. 1 pint (16 fl. oz.). .